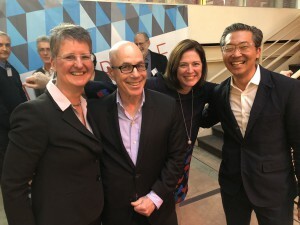 Executive Dean Barbara Klinkhammer, President and CEO Stephen Klasko, Collaborative Executive Director Beth Miller and JeffDESIGN’s Bon Ku at the Celebration of Design and Community. Philadelphia’s Community Design Collaborative gave its Leverage 2018 award to President and CEO Stephen Klasko, MD, MBA, for excellence in design at Jefferson (Philadelphia University + Thomas Jefferson University). The award recognized two Jefferson entities: JeffDESIGN, including the curriculum for design thinking in medicine; and the College of Architecture and the Built Environment. Joining Dr. Klasko at the Celebration of Design and Community on April 10 were Barbara Klinkhammer, executive dean of the College Architecture and the Built Environment, and Bon Ku, MD, MPP, assistant dean for health and design, and director of JeffDESIGN. The Community Design Collaborative provides pro bono architectural and design services to nonprofit organizations and raises awareness of the importance of design in revitalizing communities. This year, the Collaborative has provided volunteer design services to a new initiative at JeffDESIGN—a mobile design thinking laboratory called CoLab Philadelphia, which will travel to different neighborhoods throughout the city. CoLab Philadelphia will be launched at a community event in Kensington on April 25. “This award from an organization that includes so many of our graduates shows that our commitment to improving our city, neighborhoods and community is alive and well,” Klinkhammer said.